Important Note: The letters and images on this page have been reprinted with permission from the authors and/or copyright holders. These permissions extend only to annerice.com and are not transferrable. Therefore, no letter or image on this page may be copied, reproduced, posted, excerpted, or otherwise employed outside of annerice.com, unless done so by the author or with the author's express permission to the displaying entity. Mrs. Rice expresses her deepest gratitude to these readers, who have so kindly agreed to have their personal words shared with others. To send Mrs. Rice your thoughts on Christ the Lord: The Road to Cana, please e-mail her directly at anneobrienrice@gmail.com. First I think it's pretty darn cool that someone as celebrated as you are will have a contact email for fans, and second if you would want for some unlikely reason to publish this, that's fine. I just finished Christ the Lord; Out of Egypt and The Road to Cana. �I am not the brightest bulb in the lamp and I'm sure many of your incredibly educated, and philosophizing readers would smirk at my slow wits, but I still wanted to let you know that I really enjoyed the novels. �I cried throughout both of them - not only because of the realistic imagery but because my adoration for my Savior increased (which I didn't think was possible). As a mother, the thought of being Mary seems a cruel gift and you wrote her splendidly. �The light you shed on the downtrodden woman in the Middle East is essential for teaching compassion for the past, and necessary for igniting change for the future. �The families were a very human touch and I also believe very probable. �The accurate history and geography was exciting to read in a fiction novel with stories and faces to bring alive boring stats. �Your spin on John the Baptist was so cool - I bet he was a feisty piece of work! �To be a strict Jew back in the day, hearing someone speak to Pharisees that way; wow! �That would have been mind blowing! �And of course, your painting of Jesus was beautiful. �The real man that once walked this same dirt earth that we walk on; and yet the Lord? �Unimaginable for me, but you really brought it to life. �I especially loved His human love and desire for Avigail. �I don't understand some of the critics; what's sinful about falling inlove? �I personally think that it's perfectly normal for a man to love a woman and vice versa. �If it wasn't normal then I guess the ol' human race would have died out a good while ago. �Nothing funky has to happen just because you love someone in your heart. �If the Scriptures tell us that He has suffered as we suffer then I believe it's very likely He would have loved a woman....someone His family would have already planned for Him to marry when He came of age. �Since practically every person on planet Earth feels the heartbreak of love then I see it as a perfect opportunity for people to go to Him if He has truly felt the heartache they feel. �It would also be a great example for people to live by to abstain from sin until they have made their vows to their betrothed. �Critics......I think they take themselves to seriously and I really don't see why they have jobs, or who cares to listen? �I don't. �That's why we have our own BRAINS! I applaud your great work, but I applaud with ALL of my heart our King that brought you into His Body. �I am delighted for you that you have found the peace that flows through the true believer and the contentment that only Yeshua can provide. �I am also delighted to call you sister now and perhaps we'll embrace in the next Kingdom. �I never read your old novels to be honest. �I was once a prisoner of darkness, and when I finally found The Light, I abstained heavily from anything that could have drug me back to the pit. �I still do and I don't regret or miss anything. �My husband says I live in fantastyland, but I don't care! �I love my life, my freedom, and my Lord, and I will do anything to keep temptation (even, and especially, an untainted mind) far from me. �I am looking forward to your wonderful books to come! �I really am excited about the next in this series and what works Jesus will do with his new disciples. �I know the work He does in my heart daily and He is amazing. �How can his cup of forgiveness be so deep? Anywho - I'm signing off to crawl in bed with my babygirl. �I wish you sheer joy, happiness, peace, contentment, the fruits of the spirit, instruction from The Almighty, the filling of the Holy Ghost, whispers from Heaven, and yes, even more success. �The insanely huge opportunity you have now to influence nonbelievers.....it brings tears to my eyes right now! �How lucky you are to be such a useful vessel to Him. �I am so glad in my heart that you are in His arms now. �My heart leapt within me when I read that you had converted. �Speaking of; time for me to order Called Out of Darkness. �I can't wait to read it too. Truly, truly Anne Rice - God bless and keep you! I recently read Christ The Lord: Out of Egypt. At first, I wassceptical. I wanted so badly to read another Vampire Chronicle book,�was thirsting for Lestat, that I was afraid that this book was going�to be way out of my "reading league".�Boy was I wrong. I was beyond�pleasantly surprised! You have such an amazing way of describing�things, whether it's a tree with moss or a candelabra on the wall, to�the scent of the night air. When I read your books, I can escape for�hours in another world, a movie in my own mind. Out of Egypt was no�different for me. You captivated me from the beginning all the way til the end of thebook. All along the way, I have searched in myself for that faith that�I have been struggling to take hold of. I was afraid that growing up�with the strong Catholic beliefs of my parents, that it would prevent�me from developing my own sense of spirituality, my place and faith in�this world, this life, and more so, myself. you've inspired me to write, to keep writing, to write when it hurts,which where my best work comes from (tooting my own horn, i should be�ashamed haha) But I have learned that I am my own worst enemy, and I�stopped being afraid of the unknown just a few short years ago. Lestat�helped me build my attitude, Louis helped me stay humble always,�Claudia has reminded me of the brattier side of myself, the adult�dying to get out of the child's body, but mostly, you have helped me�discover much more about myself by being able to escape into your�beautiful stories. than I could ever truly know. Thank you Anne. From the bottom of my�heart. at least get the chance to read it. I am a new fan of yours, having only read one of your books so far. But it was enough to get me hooked! earlier works have been labeled satanic or immoral. My real reason for writing you is to share with you what The Road to�Cana meant to me.� I will try to be brief because I know you are busy,�but there's a little bit of detail in my explanation. I bought your book, The Road to Cana, some time ago, but had not had�time to get much past the first chapter, until this past weekend (the�17th).� The timing of reading your book was completely a God thing.�Let me explain why. The next week was filled with long road trips as I dealt with familyissues, so I did not have a lot of time to process all the emotion�that I was feeling.� And then, I arrived back home on Friday night,�the 16th, only to turn around and go on yet another road trip onSaturday, to an air show with my husband and sons.� This time,however, I purposed to take your book, beacuse I felt so drawn to it.�It was if I had to read it.� So, while my husband drove to the airshow that morning, and back that night, I read.� And read.� And read�some more. Nazareth, and the struggles He faced there, and the tensions in Hisrelationships.� You put such a human face on Him, without diminishing�His divinity.� He seemed so REAL...� during�the whole drive to the air�show (4 hours) I was totally oblivious to everything around me.� I was�in another place, a small village, enduring with Jesus the�never-ending questions and impatience of James and Jason.� It was if�my heart was in His life, and His life was in my heart. But the real point of contact came on the way home, as He dealt with�the villagers when He and Avigail were caught in the olive grove�together. The realization that He loved Avigail so much, and yet could not have�her (or chose to not have her), hit me like a freight train.� And as�Jesus made provision for her with His own gifts, giving up Hisopportunity for her, and making sure she was taken care of, my heart�broke.� Here, in your story, God spoke to me so strongly.� It was�almost as if Jesus was in the car with me, whispering into my ear, "I�know what it's like to�experience loss.� I know what it's like to love�someone, and not be able to have them.� I know what it's like, to miss�opportunities..."� I suddenly realized how much Jesus really�understood what I was feeling about my life, and the loss that I felt. And�I knew even stronger how much He really does love who I am, and�how much it hurt Him for me to experience the abuse and the pain that�I went through. Even writing this now, I am crying. I still don't understand why God allowed me to go through this awful�experience at such a�young age.� But I know that He loves me, and He�understands the pain that I feel.� And somehow, He will resurrect what�once was, and will heal the pain, and will help me to be who I really�am. I particularly loved the comments Jesus made, when�He said He was�letting go of the losing, but not letting go�of the knowing.� That was�powerful. healing that is taking place in me -- pastor, counselor, many friends,�books, and other things -- and the journey has been amazing.� And your�book has been part of that journey.� So thank you for writing it. Will you be writing about His ministry, death and resurrection?� Would�it be possible to put all of that in one book? Many blessings upon you as you continue your life's call. I have recently finished reading "Called out of Darkness", "Christ the�Lord, Out of Egypt" & "Christ the Lord, Road to Cana" and I just have�to share with you how much I�love all three of these books! separated from the church, and regrettably as a result, separated from�our Lord.� "Called out of Darkness" touched me in ways I can barely�put into words.� The powerful story of your call from atheism to a�renewed relationship with Jesus is�beautifully written, and it spoke�to me in a very personal way.� Thank you so much for sharing your�story and for awakening in me a deeper desire to "Go to Him". to imagine His fears, His human struggles, and His own self-discovery,�as well as to imagine His loving responses to people and situations�around Him. These books have really enhanced my appreciation and�understanding of the bible and our Christian traditions, by�allowing�me to experience Jesus "first-hand". I also love your insights into the�loving and holy characters of�Mary,�and St. Joseph,�important figures for whom there is also little�biblical information. I�feel a greater devotion than ever to them as a�result of your books.� When faced with the question, what would Jesus�do? (or Mary or Joseph), I�only have to�imagine them as they are in�your books. modern-day questions, like did Jesus have brothers, (especially theone called James)?� Your explanation is totally plausible, yet remains�faithful to the teachings of the church.� I absolutely love Jesus'�confrontation with Satan in "Road to Cana", as well as your vivid�descriptions of the daily lives and rituals of the Jewish communities�of the times.� You've really brought�the story to life. me you will be writing more "Christ the Lord" books!� I am hoping you�will carry the stories right on through the lives of the apostles and�the early Christian Church (especially St. Paul, a very interesting�character).� Have you considered writing more about Mary? Thank you again Anne, for writing these books! I have been actively�sharing these books with family and friends, and �I am anxiously�awaiting your next installments! intrigued when someone I associated with 'horror' (as it is classifiedover here), produced a book about Christ. I read it. I was hooked. Ilooked you up on the net & was intrigued�to hear�your story & that you�were writing books for God now. available to borrow, but that policy has gone out of the window as far�as your books are concerned! understand Jesus' human nature. �You presented it very realistically.�Your presentation of His gradual realization of who He was was�magnificent. miraculous conception and birth. �It's an idea that makes great sense,�but one we probably never think about. �I was curious to know why you�suggested that the apostle John and Jesus were distant cousins? �Are�there sources that indicate that possibility? personally. �I also found your telling of the temptation in the desertphenomenal. �Your portrayal of the devil as a slick liar is dead on. I have read and enjoyed all your work but, I was moved by Christ the�Lord, the Road to Cana.� I am fifty-five years old and was raised as�Roman Catholic in Greenwich, Connecticut.� After almost twenty-six�years as a police officer, I retired as a sergeant from the Stamford�Connecticut Police Department and moved my family to Chester,�Virginia.� It was there that I finally found Christ. accurately represented what is written in the scriptures and gave itnew life.� As we begin to accept Christ, we hunger for the word likebabies, (2 Peter 2: 2, 3) and as the Holy Spirit fills us we realizehow truly empty we were before.� I can feel the love and respect you�have for the Lord in the way you write about him.� I know he has�touched your life. Many others have recorded the spiritual life of Jesus.� That he was a�man is precisely that fact that endears him to us all.� He put asidepower and glory to become a man, suffered as he absorbed our sins, and�willingly died on the cross that we might have eternal life.� What a�fascinating man he must have been.� I have wanted to walk and talk�with him and through your book I have an idea what that might have�been like. The two Christ the Lord books, Out of Egypt and Road to Cannamade me feel like I was there. Thank you for writing them, I have read them both several times. More than any prior book or movie on the life of Jesus and the Holy Family, they have created a feeling of understanding and witness. Imagination is a way of deepening your faith and understanding in Jesus. The books allowed me to so fully capture his life in my soul, that I more fully comprehend the amazing gift God gave us and the humanity of Jesus. The insights into his humanity are so important because they become lessons for us in how we relate to God through our own imperfections. You are welcome to publish my comments without my company name. I live in Wilmette, IL am a Catholic father of 4. Any chance your books will be made into a movie? I just wanted to thank you for your two books on our Lord. They have drawn me closer to Him and brought me a fresh understanding of his humanity, his love and compassion,of how his life could have been. I so appreciate the scholarship behind your work. I've been listening to various interviews in which you have participated and I'm so grateful to you for sharing your knowledge and experiences so openly and sincerely. God has certainly used your work�to bless my life. I eagerly await the third in the series. Am I right in thinking there might even be a fourth? It has been 19 years since I first read Interview With The Vampire.� At that point, at age 16, I became drawn to your writing without realizing why.� Even now I'll pickup your books every couple of years, devouring every single one - in a ridiculously short period of time - and will finish the last longing for more.� Please, never stop writing. It isn't that vampires and witches draw me in and of themselves; no, but the characters you've created.� These incredibly human, identifiable characters and their struggles with good vs. evil and a very poignant religious journey have called out to me over these years.� I always come back to my worn and loved books with their dog-eared pages.� Why is it that your words have touched me in a way that has shaken my very foundation?� How have you, above any other writer, captured my very heart?� Who am I to be so affected my the metaphors in your dark novels? This year, having missed my "old friends" I picked up the books and began the love affair all over again.� But this time was different.� This time I am reading the Vampire Chronicles and Christ the Lord, Out of Egypt at the same time.� I quickly found that it is my distance from God that has connected me to the dark novels.� And it is my distance from God that is pulling me to Christ The Lord, Out Of Egypt and Christ The Lord, Road To Cana.� My heart aches.� My soul aches.� I am starved for my God, to reconcile with Him, to receive His grace. I was raised in a protestant home, Methodist to be exact, and turned away from my faith far earlier than I realized.� Always the "artsy" one in a less than artsy family, I, while my childhood could not have been more nurturing, felt a disconnect because I appreciated beauty where others did not.� For instance, where can you find more examples symbolism, architecture and statuary in one place than in old cemeteries and churches?� Here in the southern United States the month of October is special.� The air changes to that crispness that reminds you of tart apples, the sky is the deepest blue, with many days when a cloud cannot be seen.� As the leaves change color they release this fresh and distinct smell that I find intoxicating.� A pretty day here in October can send me positively reeling.� Hearing Sarah Brightman sing Pie Jesu and Ave Maria reduce me to tears without fail.� How did I miss God in all of this? In Memnoch The Devil, Dora is anguished and tells Lestat that yes, we do hate God and to go with Memnoch and ask God what he wants of us.� This called up feelings I thought I had pushed away after the loss of each of three pregnancies.� When Memnoch describes his argument with God for allowing human beings to suffer, and thus not be outside of nature, I recalled my feelings of abandonment by God, of separation from others, when my twins were born 12 weeks early with multiple health concerns including brain injuries.� I sat beside their little heated enclosed beds for hours each day, for over two months in the neonatal intensive care unit; utterly powerless and unable to hold them without permission, and for short periods of time so their tiny bodies could use all of their energy to thrive.� By the way, the kids are aged three now and are perfectly healthy with no physical or developmental issues.� How did I miss God in that? I watched you on You Tube for the first time tonight, discussing your memoir and other works.� You, in so many beautiful words, described what my soul has been trying to tell my mind for quite some time.� I won't repeat your words; you know what you said, but I will say that when your read from The Vampire Armand the passage describing what he felt and saw as he tried to destroy himself in the sun, I wept also.� When you described your childhood memories of your mother's influence on your relationship with God at an early age, her encouraging you to pick flowers on the way to church to leave as an offering, the sounds, the smell of the candle wax, the beautiful statues and windows........I grieved for what my children are missing.� Not only have I turned my back on God, I have robbed my children of knowing Him in that intimate way with all of their senses.� Now, right now I make the choice to reconnect with our Lord.� To surrender all. I thank God for you, for your gift of expressing what is precisely in my soul, for being the catalyst to bring me out of darkness.� Now, please excuse me as a give the kids a kiss as they sleep. Hi Anne!!! My name is Maria Teresa, i am 19 years old and i am from Argentina. I started reading your books at the age of 16 and i fell in love with them, not only for the vampires, but because of the beauty of your words, the hughe amount of details that you put into every single chapter, that made me feel that i could see them, that i was there, that you where so intelligent and also sensitive, to put all that feelings into every sentence and that inspired me even more to follow my biggest passion wich is writing. In december, 2008 i read for the first time one of your Christian books about our Lord Jesus, and it really surprised my, you take his life and make it so aproachable for people that may not believe in him, and i think that that can touch a lot of hearts. That's why i get upset when people ask you if you will write again about vampires and witches in the future, they cannot pretend that you will go on trough all your life writing the same kind of things, you are making something completely different now, but beautiful and flawles like everything else you wrote! Because you are an amazing vampire writer, but most of all you are an AMAZING writer!! so people should take you for who you are or leave you! I need to say that i am so proud of you and your return to the Catolic Church, i can see that you have a lot of peace in your heart now and you are trying to take us, our readers to follow thesame path you did and thats something that i admire of you as a person. I hae been catholic for all my life, but from 16 to 18 i had a crisis of faith, i thought that there was no reason to believe in Jesus and that church was lying to all of us. I felt so lost and alone, and your books, your characters, your writing, your vampires and witches and their thinking, held my hand and kept me company. In september 2008 i have reborn again in my faith, i found the neverendig love of god,i melt in christ and surrendered my life to him in a more concient way. Few months lather i found your video in youtbe explaining that you where back into the arms of love and now you where writing for him only, and i cant stert explaining how happy that made me feel, i cried while i heard your words, cryied of happines, whitout knowing it i have prayed a lot for you, because i didnt know that you where back on the church and i was worried about you because i care about you, i care about the person behind the wonderful writer, so seeing yo so peacefull and lovely was like a gift from heaven to me, it really was. I dont love, your ampire books, i dont love your witch books, i dont love your christian books, I LOVE YOUR BOOKS!!! AND I LOVE YOU!! wich means that i will follow anything you write because i respect you so much. You have a big big place in my heart, and it will allways be like that. Thank you so much for giving birth to so many awsome books. You made me fall in love with Jesus again. I was a huge fan of your earlier books especially your Vampire Chronicles. However, when I re-dedicated my life to God I must admit, I gave all of your books away.� You see, your writing creates characters and environments that have the ability to get into my head and stay there and I felt your earlier subjects were now a bit too dark too occupy my thoughts, (which I was trying very hard to keep focused on the things of God). In addition to the books I find your testimony of faith and return to God also inspiring. To give back to God the talents he has blessed us with is a goal all believers should pusue. Myself, my husband and a small dedicated team are in the final stages of launching a website called kindomrepresent.com (due to launch in September 2009) which will focus on Christian culture and community. For the book review feature of the site, I would love to write a review of Christ the Lord:The Road to Cana knowing that it will inspire others as it has inspired me, to seek the Lord in deeper ways. Thank you for writing these books. Thank you for sharing your faith and the gift that God has blessed you with to glorify Him. I pray that your faith and inspiration will continue to grow withour bounds. I am excited about the October release of "Angel Time". Like I said in my last e-mail, I have been a fan of your writing since Louis came public with the story of his life many years ago. I began reading your books as a teenager.��The small light that you used to explore the darkest parts of human nature was one of the most powerful influences of my young life. My own return to Christianity changed my life and my choices in� many ways. I am now the mother or a teenager, who has developed an interest in the supernatural because of the return of vampires as central figures in pop culture. I have been nudging her toward your Vampire�books, in anticipation of "Angel Time." I believe that you will do for Angels what you did for Vampires. You will serve to strengthen the faith of many people who may be faltering, and you may very well draw some of your own�fans out of darkness. I am certain you will explore the good in human nature with the same insight and sensitivity that you used in exploring the nature of evil. I pray God's blessing on the release of "Angel Time" and I pray that it�reaches people in the way that�you hope it will. I know folks have clamored for the Lestat redeemed story, but only you can know if that is your mission at this time or any time. �I support wholeheartedly the path you are taking (which doesn't mean I love the vampire chronicles any less for what they were to all of us as well). �It is a little like asking the Beatles to reunite in my opinion. �Even had they done so, it would have been largely nostalgic and not because they felt compelled to fulfill their musical mission in that particular way. �They all seemed to take different, equally valid or moreso paths later. �Had they felt compelled to do so musically - then only they could make that decision and I deeply respect that. �In theirs and in your case. In my life, I am a little Sunday School teacher who has by fortune been given the great gift of traveling to Africa and meeting the children there. �When I returned from my first trip, I formed an NGO called Brick by Brick for Tanzania!, Inc. to build preschools there. �We have completed two schools there (check out our website www.brickbybrickfortanzania.org to read of our mission and to see some of our slides. As such, we hold annual fundraising concerts in rural Wisconsin (last year we raised $7500 with Susan Cowsill performing). �This year we have four-time Golden Globe nominee David Carradine performing with his band. �Held on August 20th in Kewaskum Wisconsin, we hope to raise enough money to build the King'ori School and to get us on the way for a school in the rugged hills of Ngarenanyuki. We'd of course love if it was possible to obtain an Anne Rice item or two to auction off. �I know those would be huge hits with our crowd and personally important to me. �If that is possible, please let me know. �We'd love it. Thanks again for being you, Anne. �You are someone who makes a difference with every word you write. �May God bless and keep you always. I have very much enjoyed your recent books and must say I enjoyed your earlier works. I too went back to church in 1997 after a long absence of 20 yrs. Keep up the good work and I hope you continue with your books on Jesus. I've just finished your 2nd 'Christ the Lord' book "The road to Cana" I thought it a masterpiece of imagination, and really loved it . I'm so looking forward to the new books you are writing. Although I have found your previous books of the Vampires etc., truly magnificent, I'm glad you have decided to follow this new path. So far I have found them very uplifting, in the context of my own Catholic faith; I'm sure it is this very faith that has enabled me to appreciate your fascinating and clever stories of the "Dark World"! I wanted to tell you a little about myself. I am a soon to be 40 woman, married with no children. My goal in early life was to be a writer, graduating with a BA in Journalism/Communications. Obviously, that did not turn out as expected.� I have had many hard times in my life and because of those things, I turned away from my faith.� I didn't turn away from God, per say, as I always prayed at night, but it wasn't a close relationship, merely a habit.� I have been a fan of yours since my sophomore year in college when "The Queen of the Damned" was assigned as a reading assignment.� I loved it, and from there on, I have read everything you have written, including those of your other pen name.� When I saw your newest books about Christ, I have to honest, I was scared of them. I am not sure why it scared me, but the thought of getting back into that scared me.� I, about two weeks ago, went to the library and saw your books, and checked out Christ the Lord, Out of Egypt. I must tell you, being a fan, a HUGE fan, you being my favorite author ever, made me feel more than the other books did. I am not saying that your other books were lacking in any way, its just this book made me cry, feel and wonder about things I hadn't wondered about in many many years.� I finished the book in 2 days and went right away to get the second book.� Again, my mind raced and my heart grew with emotions.� I cannot tell you how I felt.� I then checked out the audio version of "Called out of Darkness", I was riveted. Anne, I have told people I would never have about your books, books about Christ, when I never spoke of it before. I am scared to go to church again, alone, but I am trying and I want to.� Thank you for the books, as they have made a difference in my life.� You have been in my life since 1992 I believe, and I will never be able to thank you for the countless hours of enjoyment I have had with your novels. I cannot wait to read more. I would love nothing more than to hear from you, it would be a dream, but I also understand so many others have the exact same dream. Thank you again for your talent, You have changed my life. Thanks for all you've given to your fans, old and new! I just wanted to thank you for your two books on our Lord. They have�drawn me closer to Him and brought me a fresh understanding of his�humanity, his love and compassion,of how his life could have been. I�so appreciate the scholarship behind your work. I've been listening to various interviews in which you haveparticipated and I'm so grateful to you for sharing your knowledgeand�experiences so openly and sincerely. God has certainly used your work�to bless my life. I eagerly await the third in the series. Am I right�in thinking there might even be a fourth? I am in the middle of reading [The Road to Cana] and had to stop to�write to you. �The ending of Chapter 14 moved me to tears. �I am a�Muslim reader of you or Iraqi origin who has been in the US since�1970. �I first discovered you when I picked up "The Vampire Lestat"�when it first came out, and have been a avid reader of yours ever�since. �I must confess that the first three or four volumes of the�Vampire Chronicles are my favorites, as well as series on the�"witches." Thank you for writing about the Christ in such a moving manner. �All�Muslims are lovers of his and his beloved Mother, the Holy Virgin. I have been a fan of your work for many years. Your novels chronicle a�coming-of-age and spirituality for me that I will always hold close to�my heart. After reading the two books in your stunning "Christ The Lord" series,�I felt compelled to revisit your earlier works from a new perspective.�I feel almost a spiritual "need" if you will, to look at these earlier�works through a completely different set of eyes. I have just finished�re-reading "Blood Canticle" and there are some aspects of this book�that I cannot ignore- things that never occurred to me the first time�I read it when it was originally published. book; I think even more so than in "Memnoch the Devil." His ambitions�of becoming a saint, even though this comes directly from Lestat's own�vanity,�and his imagined encounter with Pope John�Paul II all reflect�how much his (and your) spirit has grown as a result of writing these�novels. Lestat was never more vibrant and wonderful than in this book.�For the first time, he comes across shamelessly selfless, even in�spite of his ego. Love, as he says, is his song. Beautiful. As you have commented on, there was so much negative press for both of�these books ("Canticle" and "Memnoch") and even back when I first read�them, I could never really understand why. As you have said several�times, the characters in your earlier works are all searching for�light and beauty in spite of the darkness that surrounds them. This�parallels life in so many respects. "Christ The Lord" is such a�natural apotheosis of all the previous books; a culmination of the�spiritual struggle of every character you have ever written. I truly�believe that God has called you to your vocation and your talent,�through the darkness into the light, in writing for Christ- as surely�as he calls nuns and priests to their holy vocations. You are a gift�to the world, Anne.� Please feel free to publish this letter on your�site as you see fit. It would be an honor. I am a deployed Solider in Iraq about to come home to my duty station�in Germany. I just wanted to thank you for all of your novels. I�started reading your novels over a decade ago and have gotten much�enjoyment from them. As much as I love all of your work I would also�like to thank you for your novels on Christ. You are a wonderful�writer and I appreciate all your work. It gets me through many long�nights. While I have grown up knowing your name, it was not until Christthe�Lord, the Road to Cana that I personally knew your work.�Like so many�books that change our lives, yours was one that�stumbled unexpectedly�into my life. This was during the time of my own conversion journey�last year through the RCIA and I was so hungry for God, for Christ.�The Road to Cana satiated me. There are authors I admire whose�spirituality helps me better understand my own, but it was the love I�felt in your book,your painstaking attention to every detail, your�unspoken dedication to treating His story reverently, delicately, that�has moved me beyond others. Your book filled my soul. I fell in love and because of your work, Christ became alive for meand He became my friend. I was able to relate to Him, to know Himbetter. You brought Him to life for me, you made His story tangible and�vivid. Because of your book, for the first time when I walked into the�sanctuary of my church and saw our Lord hanging on the Cross, I felt�His pain and I cried. It was the first time I recognized Christ as my�beloved, the one I had spent the morning with until I had to close the�book in order to attend Mass. Conversion is a process and happens so differently for each of us.For me, I was needing to "see" Jesus in order to know Him as my Lord.�Your words opened my eyes, bringing me into His life, while never�making me feel I was reading a work in contrary to my faith. I could�feel your dedication to honoring Christ, to sharing His love with the�world. Truly I don't have the words to capture how deeply this work has moved�me, but please know how thankful I am for it. I�recommend it to�everyone I know, hoping that it will move them as deeply as it did me.�Your gift as a writer has yielded its most glorious harvest. God bless you and your health. And thank you for heeding God'scall. explanations along with the denominational slant, but never have Iread (perhaps with the single exception of The Last Temptation ofChrist) an account of Christ's life that actually portrayed him in hishumanity. I have delighted in exploring the reference material in your�bibliography and have expanded my library substantially for future�enlightenment. In reading your earlier works, I was always amazed at how you could�build a character piece by piece and immerse him in such detailed and�beautiful settings. You found beauty in the darkness I never knew�existed before. Then you opened my eyes to absolute beauty in a man I�thought I knew and understood, but really never saw as clearly as�through your mind and heart. As much as I have read and as good a researcher as I consider myself�to be, I never fully realized the land of the Jews was in constant�warfare, and turmoil. I have come to realize that Jesus walked in a�time when one was only a heartbeat away from a zealot's arrow or Roman�sword, or a stone thrown in religious fervor. I never fully conceived�of the possibility that Christ feared as a child, or struggled with�his destiny. I was enthralled with your account of His encounter with�Satan. I had never before felt the strength and power on both sides of�the confrontation and it was truly an inspiration. "mikvah" and its importance in their daily lives; the life in thehome�of the extended family and their devotion and care of the child Jesus.�You transported me to His time to stand as He as a small child and�look through his eyes in awe of the Temple in Jerusalem. That alone�was worth the price of the book. When I first began Out of Egypt I was somewhat annoyed that you were�using "first person" in His dialogue. However, the more I read and�became deeper immersed in the narrative, I became aware of the feeling�of "walking the walk," and "talking the talk," and it created a�closeness with Christ I had never had before. You will always have a�special place in my heart for letting me share your journey and�shedding a lot of light in my own personal darkness. These words are yours to use to your advantage in any way you deem necessary. May you continue to be blessed by the Love of Our Lord Jesus Christ. continue to serve the Lord. I enjoyed " Out Of Egypt " immensely. I had read most of your Vampire works when I was younger. The last book I had read was "Servant of the Bones". I answered the Lord's call in 1994, and have read almost nothing except texts since that time. While I enjoy the mystery,and poetry that is the King James, I missed the visuals (if that's a good term) that I had while reading your work. I've read most of the early writings and was familiar with the stories of Jesus's youth. Your vivid descriptions,and weaving of the tales was refreshing, and left me considering aspects of Jesus's childhood I had never considered. We were very pleased with the article on Anne Rice (NZ Catholic, June 1), who is well deserving of a place in your paper. We have read her first two books on Christ the Lord and are really impressed with them. We can understand that there are readers who find it difficult to accept some of the characterisation, but when the author's note is read one can truly understand her motive in writing the books. After her return to the Faith, Anne was passionate about taking the Jesus of the Gospels and trying to understand him as a human person. She was looking for the truly human Jesus, the Jesus who was loving, compassionate and in touch with human suffering. She wrote her novels "in the hope that Jesus will be as real to you as any other character I've ever launched into the world we share" (author's note). Because Anne's books are novels we do not have to believe every detail. The main thrust of the books is to help us know Jesus better and to become aware of the times in which he lived and the events surrounding his childhood and older years. Anne is known for her historical accuracy. She stated in her author's note that no matter how imaginative the plot and characters, the background would be thoroughly historically accurate. We are looking forward to Anne's third book, which will delve into Jesus' ministry up to the Passion. If her novels give us a broader outlook on the person of Jesus and result in a deeper love of him as a person and the Son of God, then we can rejoice in the books that Anne has written for us. It is Christ's personal love that saves us from ourselves, and a personal love for one another that saves the world one heart at a time. �Thank you for that insight. �Again thank you for your work in bringing our beloved Christ and his family to life through your novels. �It is truly blessed and inspired. I posted a review on Amazon for The Road to Cana, and it's been placed in the top three, receiving many positive votes. I absolutely loved what you did with this book. Without exaggeration, it's the best book I've read in the past year. I am a Christian, born Catholic, raised Protestant, and no longer worried about those titles so much as knowing Jesus. You present his life in The Road to Cana with such a beautiful balance between his deity and humanity. The temptation in the wilderness is amazing, and the follow up to the deliverance of Mary Magdalene was an awesome transition. I could go on and on, but I wanted to thank you for this poignant book. I tried to read scenes to my wife, and kept tearing up. You are more than welcome to share my comments on your site, but they are truly meant for you as an encouragement from a fellow writer, believer, and human being! I really have trouble understanding the need for priestly celibacy and have tried to dig deeper into biblical/historical reasons for celibacy. Do you have any suggestions for reading materials? Will you be addressing celibacy, perhaps from the apostle viewpoint, in your next book? I am also writing to ask you to write a rosary guide, using stories and historical facts that are available to you through your research. My prayers are with you as you lead us in spiritual growth through your research and writings. I am sharing your books with all of my Catholic friends. Oh, please, when is the next installment due out? �Soon, please, please, please? But the attitude of all those around the “sinless one” (mostly family) is what makes it all such a tragically human story. I am the father of Chloe. �I have written you before with regard to her comments on your first CHRIST THE LORD novel and appreciated your warm response. I have just completed reading CHRIST THE LORD - ROAD TO CANA. �It was wonderful. The first two pages are the ones I still love the most. �I read them to my (now six-year-old) daughter up through the words, "...a maiden who became in the easy tumult of dreams my Avigail." "Well, I think that everybody has to love someone." By the way, congratulations on another wonderful novel. �I continue to be dumbfounded at the audacity of your mission, with so much set in stone and immovable about the life of Christ by revelation and tradition. �But you have succeeded in finding the story where few could honestly dispute you...on the Inside. I simply cannot find the right words to truly express my gratitude for your beautifully written novel, “Christ The Lord: The Road to Cana”. �I just finished it last night, and I hated to come to the end. I enjoyed “Out of Egypt”, and was looking forward to the next in your series. The way you have written from Christ’s perspective has given me renewed strength in my own faith. �While I was reading the section that described his time in the wilderness, and how he came to perceive the collective thoughts and feelings of an entire world, I had to put the book down as I couldn’t read through my tears. �It truly brought home to me just how much Jesus has taken on in order to save us. While I thoroughly enjoyed reading your Vampire Chronicles and the stories of the Mayfair Witches, this�.this is truly a masterwork. �My most sincere congratulations and deepest thanks! I purchased your book Christ The Lord , The Road to Cana last week. �I was hesitant to pick it up and begin reading as I knew I would blow �right through it as I did CTL, Out of Egypt. I am a slow reader and have �been so all my life. But your amazing gift of giving life to words on a page �is a wonder. Sure enough, I began reading �yesterday and finished it today. As I read the the part where Jesus and Avigail are in the grove and Jesus �is trying to protect her from the mob, he calls to �the Father and requests "Father, send the rain". �I was �suddenly back in the Out of Egypt passage where as a child, ��Jesus wraps his arms around Cleopas in the river and begs the Father �to let Cleopas be with him as is His will. I don't know what took me �there but I believe it is the innocence reflected in both requests and �your ability to project that laying somewhere dormant in His mind the �power to make this happen exists in Him but acquiesting to the Father as �he was still being shaped by Him. Later, I was enthralled at how you wove the temptation in the desert. We �all know the short version but your God given ability for the �written word, transported me there and held me in place. I felt I was standing �next to Jesus watching this all unfold. Feeling his strength �and loving Him more when he told Beelzebub to blow off (obviously, my �words). As I finished the book I felt a sense of loss that it had come to an end. �Having said that, I look forward with anticipation to the next book(s) in this �series. I know they will come as it is His will that you bring more souls to �him with your heart and gift of the written word. Thank you. Recently I finished your book, "Christ the Lord: the Road to Cana." I enjoyed it very much. Don't take this wrong, but occasionally I am struck with presumptuousness of a novel about the Son of God being written in first person. But then, the point behind the Incarnation is that of God becoming man, beheld by human eyes and touched by human hands--in time. The two natures in Christ, portrayed in word, is iconic. As Peter Kreeft relates, your description of the temptation in the wilderness was wonderful. Satan looking like Christ was a nice touch; it reminded me of the story of St. Antony where the devil took up the physical image of Jesus, but the great saint was not taken in. I have been reading your novels for many years. �"Road to Cana" is the first book that I have read twice. �I am not a church-going Christian but I am very interested in the life of Jesus, as I was a church goer in my youth. �The Christ Series took great courage on your part to attempt. �Cana is an amazingingly successful book. �Congratulations to you for this beautiful testament. I am trying to convince friends to read it, and it is a tough sell given the premise. Thank you for writing such beautiful books. �I just fininshed re-reading "Interview with the Vampire" as well. �I'm on a bit of a spiritual journey myself at the moment and it is very interesting to go back and read your first Vampire book after reading Cana. �Your journey is all over these pages. �Thank you for opening yourself up like that. �These books mean a great deal to me. Dear Anne, Thank you for the “Christ the Lord” series. Since a young age I have been told that when I pray to Jesus, He understands. For the most part I wondered about that because prior to His ministry we know very little about his upbringing. From the New Testament we know that Jesus was born in Nazareth � then the family fled to Egypt � then at age 12 Jesus was left behind at the Tempe, then we meet Him again being Baptized and at the wedding in Cana. You have filled in the gaps for us. The vast research you have done for this series, including many New Testament Scholars and historians of Jesus’ time like Josephus lends a real credibility to your books. Giving us N. T. Wright as a reference to go to is an extra gift along with your books. We have probably all wondered from time to time � how did Jesus prepare to fulfill the mission His Father had for Him. You have made it quite simple really � He lived life. He was part of a loving and responsible and religious family. He was a fine craftsman, he was a peacemaker, He was a man trying to determine who He was, what He was to do and He was a compassionate man never backing down from doing the right thing. We see the pattern forming of Jesus going away to be alone to pray � basically He teaches us how to pray to His Father. Jesus knew He was called to be celibate and struggled as all humans struggle with sexual temptations. Jesus was part of a family, a very large family. Knowing about His family puts a lot of pieces together. Jesus endured sibling rivalry, family conflicts, family struggles and just about everything else that all of us struggle with everyday. I can now see how influential, Mary and Joseph were in forming the human personality of Jesus. Jesus also was raised during a time of turmoil and civil unrest. His life with Mary and Joseph prepared Him to be a compassionate person, unafraid to show compassion to women when it was not “allowed”. Jesus also learned early on from Joseph that there are two ways to fight against tyranny � peacefully or forcefully and He was raised to face conflict peacefully. You have given us a real feel for the family of Jesus � not just Mary and Joseph but His extended family of step-brothers and sisters, aunts, uncles, cousins. Jesus was a son, a brother and an uncle. He was a carpenter who took great pride in His work. We also learn about family customs and traditions at the time Jesus lived. Your portrait of the lives of Joseph and Mary and all that they did within the family sure makes it easier to follow in their footsteps. Learning more about James, the son of Joseph, makes reading his letter in the New Testament seem more personal. I feel I know him. I know that some people are bothered by and think that if we look at the humanity of Jesus we lessen His being the Son of God. Definitely not so. There is no question in my mind that Jesus is the Son of God. Looking at Jesus only as the Son of God makes it hard for us humans to relate to Him in everyday life - family life, personal trials, work problems and civil matters. Well thanks to your writing, I can now really feel that when I pray for help in my everyday trials and concerns for life and peace today that Jesus does understand, because He lived through it. By seeing and getting the feeling of His human side, His upbringing and family life, I can relate more to Him as the Son of God who truly does understand my daily human life of struggle. How interesting to realize that Jesus was familiar with Pontius Pilate before being brought before Him during His trial. Jesus refuses to join the crowd going to challenge Pilate � showing us again and again, that we must try to resist peacefully. Jesus also saw how Pilate would react to the masses of people regarding their religious matters and how he would eventually give in to them. Jesus struggled early on with who He was and wanting to know His Father’s will for Him. That is so familiar to us Christians. Also, Jesus was not afraid to “break custom” when it had to do with being compassionate. His caring for Avigail after she was assaulted by the brigand was an early sign of how He would treat women in the NT. Interesting also is that Jesus had to wait for God’s timing to begin His ministry, just as we always have to wait for God’s timing when praying for help or resolution to problems. His step-brother James pushed and pushed Him to “get on with it” but Jesus prayed for God’s Will. You helped me to realize that Jesus must have been aware that He had special abilities as He was growing up and He struggled with it. It’s not realistic to think that all of a sudden He was transformed from an everyday person to ministering as the Son of God. I find that comforting. Most of us struggle at one time or another about what to do with our gifts and are we doing God’s will. You also answered the question about John and Jesus. You made it easy to see that they both always knew there was a connection between them and to see it to its fruition when John began to Baptize and Jesus realized that His time was coming. From the moment of Baptism, when His divinity was made know, things happen quickly � I like the way you have Him facing off with the devil, then He calls His first Apostles, and then performs His first miracle at Cana, as always surrounded by His family. Many things in the two books will stay with me, but two things that touched me in a special way: from “Out of Egypt” as they were approaching Jerusalem, Joseph put Jesus up on his shoulders so He could see the temple and in “The Road to Cana” when Jesus says “I loved the faces of old men”. Can’t wait for your next book in this series. I purchased your newest book, The Road to Cana. After letting it sit for a mere 1 day, I began to read. I was mesmerized by the sheer fact that you have the uncanny ability to take me and my imagination back into a time before time. The story was wondeful. The manner in �which you manage to make Christ a human with human qualities, probably did more for my faith than you will ever know. As my mom is very ill, I have continued to turn to God for answers that don't seem to appear in my time, but I do know the answers will be available to me in Gods time. I have to admit that I have avoided your book�Christ the Lord- Out of Egypt�because, well, I just didn't think I would want to read what you had to say. I have never read your vampire books because the subject doesn't interest me. When I first heard about Christ the Lord, I was intrigued, but just didn't read it. I mean- you're the vampire lady, right? Then almost two weeks ago I was at my library and saw it. I decided to give it a try. And oh- I am so very glad I did. I have been a Christian all my life. I can't tell you a time when I didn't know God. He has been part of my life as long as I can remember- there was never doubt he existed, just the fact that He was. I can remember as a child just knowing. Reading your book has brought a whole new dimension to my understanding and thoughts Christ. I can't even put it into words. I appreciate the historical detail, the vivid descriptions of the places and politics. I also love the way you show the different "brands" of Judaism of the times and how it's okay to be different. The way you painted a picture of Mary and Joseph ... sorry- I will stop because I�truly�can't put into words what this book means to me. I cried several times while reading it because it truly spoke to me in a way nothing else has. When I finished, I realized that it was true what I had been taught- Jesus is my comfort because He went through everything in His life as a human that I have gone through in mine- pain, happiness, sorrow, joy, desolation, loneliness, peace- He felt it all. That is why there is no friend in the world like Him. I am going to buy my own copy of�Out of Egypt�and can't wait to get�The Road To Cana. I have recommended it to many of my friends and will continue to do so. I teach Sunday School and will refer this to my students. I feel it is a true addition to my life of faith and has stimulated my mind- something which too many "religious" books nowadays don't tend to do. introduced me to the books. I bought the /Road to Cana/ . Thank you for writing�these books. I have been a Christian since I was a child (now 58 yrs old) and�although I have read the Bible through twice, I have learned so much�about that�period of time from your books. It has made my Lord seem even more real�and has brought me�closer to Him. I am impressed at how true to the Gospels your writing is. Thank you again. May He bless you and continue to use you inbuilding His Kingdom. I can't find the words to tell you how much these two books have moved me. I have been an ardent fan of yours for many years. I have read most, if not all, of your books. However, being a cradle Catholic who was away from the sacraments and going down the wrong road and having returned once again in 1998, I can so totally relate to your situation. I am now a Lay Carmelite and will probably make my final promises in August, 2010. I'm just mentioning this to let you know how passionately I came back to realize the truths of our religion. It never really leaves you. We just kind of bury it inside ourselves, that is until He calls us back. Thank you so much. I am forever grateful to you for your writing. I can't wait for the next book to come out. P. S. The only thing I do want to mention is that I believe that both Jesus and Mary were at St. Joseph's side when he died. That's why he is known as the Patron Saint of a Happy Death (among other titles). Who wouldn't be happy with Jesus and Mary at their side on their deathbed. I have never written to an author before, and I hope you don't mind my message, but I had just finished your book, "Christ the Lord, Out of Egypt". �This is one of the most inspiring books I have read! �I have been a Christian all my life, and after reading your book and then reading how you left the Church and how you were led to return to the Church has left a wonderful feeling in me. �Although you are a Catholic and I am a Protestant, we are so close in our delight in Christ, God, and the Holy Spirit, that I do not see the differences. �Thank you so much for your devotion to research to make this possible. �I am going to purchase the newest book, and I hope there are many more to come. Although I have read many of your novels and have enjoyed them, they pale next to this book. �God Bless you in everything you do. �I am also so sorry about the loss of your husband. My spiritual director has recommended that I write this brief note to you for your marvellous Christ the Lord novels. I read the first one last year and devoured The Road to Cana as soon as Amazon shipped it to me. As a teenager I recall borrowing several of your other novels from my local library. Your writing was so vivid and your stories so engaging that I loved them then; now, as a man studying to be ordained to the priesthood, I confess that my admiration for your gifts has grown. May God bless you for using your charism to help introduce the personalities of Jesus and his family to a wider audience. In the first novel I was struck by your characterisation of Joseph, who is my family's patron saint. Joseph leapt from your pages into my prayers in a way that I never expected; my devotion to this great man was already cemented, but you have helped me colour in my prayers. Mary, Joseph and the others in a new light. Undoubtedly you have probably suffered greatly since beginning these novels, for the evil one loves to strike those who try to get closer to the Lord. If it brings you any consolation, please know that you have helped me improve my relationship with the Lord and his family. I will continue to keep you in my prayers, may you continue to share your gifts with the rest of us. I hope you continue to write the story of Christ the Lord. You truly have a gift! �. You did an amazing job. The research was unbelievable. The story about Mary Magadalan (the Demon possesed woman I assume is her) was one I had never heard of but it makes sense, as much sense as her being the shamed, adulterous woman He saved from stoning later in the Gospels. Many things sort of came up in my reading like the words "They will hate you because of Me." The part where Avigail is imprisoned in her fathers house brought that bit of scripture out to me. Whether it was intentional or not I got that out of the whole episode. Thank you so much for the tremendous effort you have endevoured on. I cannot imagine the stresses in putting together this story, the story of all stories together must be like. When Christ the Lord - Out of Egypt was published, I read it and really enjoyed it. I recently bought two copies of Christ The Lord - The Road to Cana. I kept one for myself and mailed one to a friend for her birthday. 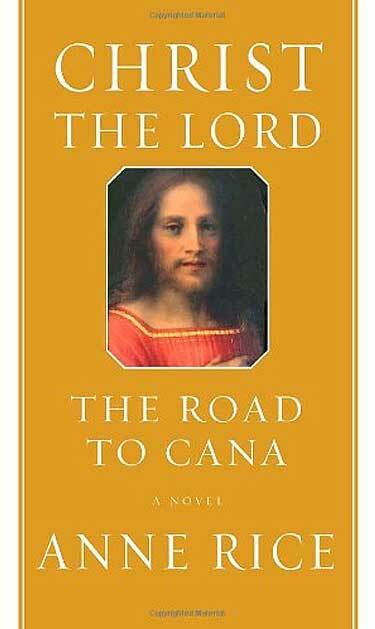 Last evening, I finished CTL The Road to Cana and absolutely loved it. I could feel my soul being encouraged throughout the reading. What an inspiration! As one who loves Jesus Christ as my Lord and Saviour, I thank you for your writing about Him. What a blessing these books are to Christians. They add a new dimension to what we already know about Jesus. I am looking forward to your Christian testimony which I was told will be published in October. I, too, am a writer and greatly appreciate your work. "STONE HAVEN: Murder Along the River"
I have a little anecdote I would like to share with you. I’ve been a fan of your work since I was 12 years old. I was first exposed to Interview with the Vampire, the film. Immediately after, I bought the Spanish translation of Interview with the vampire, because my mother would not let me read it in English. She wanted to know what I was reading, since she admitted she immediately connected your writing, with satanic writing, due to the fact that you dealt with vampires. Over the years, I’ve read your books, loving your exquisite, sensuous prose, and eye for detail. I wrote to you a couple years back, inquiring your field of study, while in the midst of an existential crisis I was going through in 9th grade. Thanks to you, and your characters� specifically Michael Curry, I will now be studying Fine Arts in Laguna College of Art and Design. Michael and Mona have truly been an inspiration to me, to better myself. Liberal Arts have ever since been my passion, and it’s something I’m thankful for. On Friday, I had an essay to write for a simulation for the AP English Literature Exam. The prompt asked to write about a character who struggled to find identity, and purpose for his existence. The first character that triggered, was Louis de Pont du Lac, as well as Lestat� seeking purpose, and meaning, in a seemingly Godless world. To my misfortune, I couldn’t use either, because apparently The Vampire Chronicles don’t qualify for ‘AP Merit’. This really disturbed me, but regardless, I couldn’t really meditate on the thought while working under pressure, trying to find a novel that applied, and try to connect everything in 45 minutes. The theme in the chronicles, then triggered the character of Mersault, in Camus’ ‘The Stranger’. Needless to say, I finished the essay on time, applying a book no one used in my classroom, provided the fact they all used Catcher in the Rye. Well, during the car ride home with my mother, I started to tell her the story I just told you. And she was thoroughly impressed, in the literary value found in the chronicles. We got deeper and deeper into the conversation, to the point where I gave her a full blown analysis of the search for meaning in the chronicles, and how you literary wrote yourself back to God through your work. After I commented on Christ the Lord out of Egypt, she said we should buy the book. I told her I’d bought it back in 2005. She said she wanted to read it, but she didn’t understand English. Yesterday, I went to the bookstore, and bought it for her in Spanish. I told her to first read your Author’s Note, to better understand the context of the book, and why your wrote it. My mother isn’t much of a reader, but she is a very devoted Catholic. She tends to fall asleep just reading a magazine. She’s more of an audio learner, than a visual learner. Regardless, she read part of the note, and this morning, she came to me, after work, and she said how utterly impressed she was, and how she couldn’t possibly believe what you’d written� how you’d lost your faith when you went to college, and returned after so many years, and how all your extensive research, and your novels up to now, had only prepared you to take such a massive and complex project, such as writing a first-person account on the life of the Lord. Needless to say, she has a completely different view of the material I’ve literally been raised with since the age of 12. I am now 18, and I’ve always considered you a mentor in terms of writing, the way you’ve always looked up to Dickens. She commented on how she can’t believe how well prepared you are, and how much effort, emotion, and research you put into everything. �She wanted me to email you, and tell you how impressed, and how thankful she is. She is now reading your book, and hopefully we’ll be going to the bookstore sometime soon, to see if they have the translated version of Christ the Lord Road to Canaan. Up until now, she’d dismissed writing as merely a hobby, as sometime to kill time with. Now she understands the deeper meaning of it, and is actually, finally supporting me in my career as an aspiring writer.